Over the past two weeks, I’ve switched out my trusty, well-worn Kinesis Freestyle2 keyboard for an ErgoDox EZ mechanical keyboard. I must say, I may be switching full-time to this keyboard! I am still learning how to use the keyboard and super swamped right now so unable to really dive in and learn how to use the advanced features. I’m committed though and will post a full review after I have had enough time to properly test and use the advanced features. In the meantime, here are some early thoughts about this keyboard. 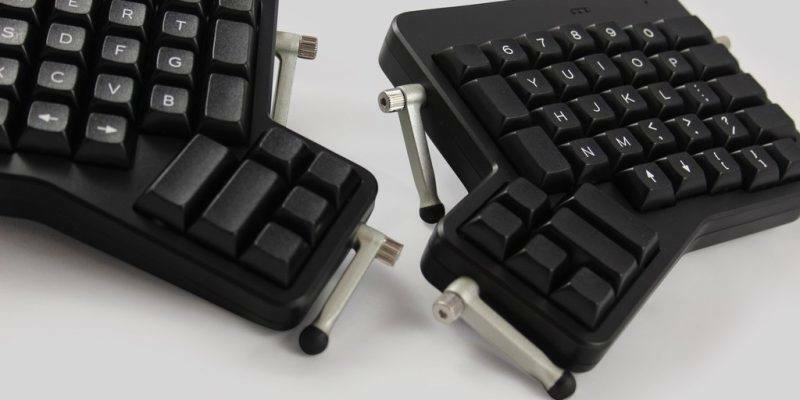 It comes with six small red washers which can be inserted between the keyboard legs and the keyboard to force the legs to have an unlimited number of adjustment angles. Without these washers, your legs click into a limited number of positions and thus make setup much faster and for newbies easier to balance. You can see the legs in the image here to the right. I suggest not installing these but saving them for later. When I get the hang of this keyboard, I may need them to make micro adjustments. I’ll keep them in the original box and recommend you do too. I placed my keyboard shoulder length apart per the recommendation. I had been using split keyboards with each side just barely touching each other so this shoulder length split is new for me and has forced me to adjust my mouse options. Now with this split I don’t have room on my keyboard tray for my trackpad so I have been playing with placing the trackpad in the middle between the split. In addition to re-learning how to type better, I have to figure out a better way to mouse around too. 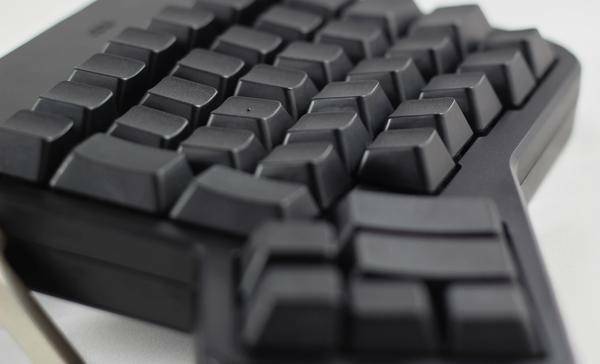 This guide should be mandatory reading for anyone buying this keyboard. I don’t remember seeing a note in the box about reading the guide first. There may have been one in my rush to pull the keyboard out. This guide is really enough to get started. 2. Mechanical keys can be really silent! 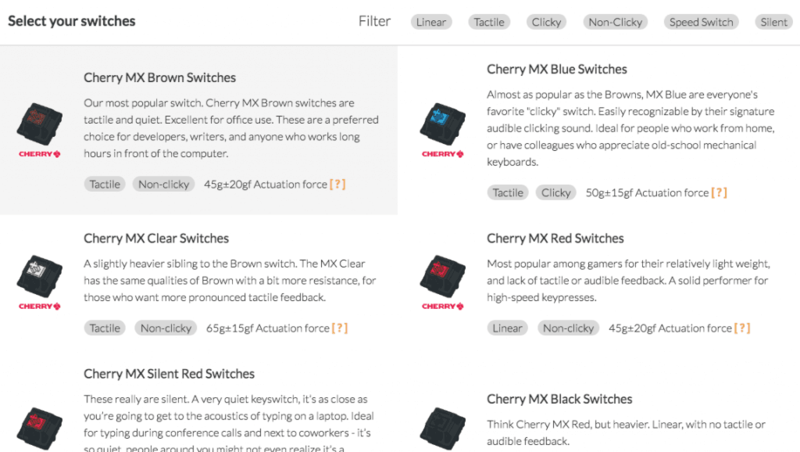 I have the Cherry MX Silent Red mechanical keys are wow, they are silent! But, they have that classic clicky, tactile, grand piano playing feel. If you work in an office with co-workers nearby, these may be the best keys to reduce your clicking around. 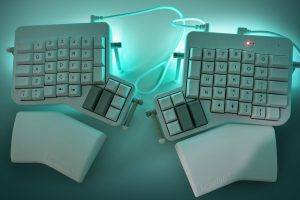 When you order your ErgoDox EZ you can select from 12 different options. See the selector screen below. They have them organized by linear, tactile, clicky, non-clicky, speed, and silent. Note, there is only one silent option. Also, look at the image below. You’ll see that these keys are sculptured, which means each row of keys is differently shaped. The bottom keys are angled upwards to meet your fingers, while the top keys are angled down. I’m old enough to have had typing classes in middle school and I remember that class vividly like learning how to count characters and position the typewriter to figure out how to center content on a page. While this is not the same re-learning, I didn’t jump right into my normal typing speed. ErgoDox EZ recommends that you use KeyHero.com which I did to track my typing progress. 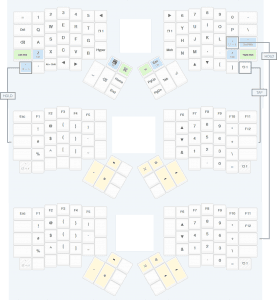 You can setup a profile and select the ErgoDox EZ. If you are a coder like I am, you can also use typing.io to practice coding up all of these special characters you’ll find in your favorite language. I skipped that one. It took me about 10 attempts before I could even type a paragraph. I had to refer to the layout guide a few times and printed one out. I kept doing things like triggering the next layer so took some time to adjust the legs to find that perfect balance. My first successful paragraph I got 13.18 words per minute with an accuracy of 91.00%. I switched back to my Kinesis Freestyle and got 64.99 WPM with a 94.46% accuracy. So I guess I am at 20% of my normal speed out the gates. There is no shortcut for this work. You have to want to re-learn to type for your future ergo health or go with another keyboard with fewer ergonomic features. I can already see that I am going to increase my productivity with this keyboard. My thumbs are going to get more work done like my left thumb taking care of spacing and backspacing and my right thumb taking care of tabbing. I’m most excited to start learning how to use a mouse layer with the keyboard. From what I have read online, most people find that layer useful but not a true mouse replacement. 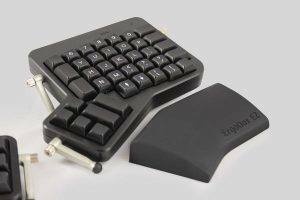 I was concerned that I may have problems going between an ErgoDox EZ and a normal keyboard. Again I went online and found enough references where people say after a few months switching between keyboards is not an issue. I got the Shine version which includes configurable LED lighting which means there is a set of LED strips on each side of the keyboard. The lights shine below the keyboard and not through the keys. The glow enough light to be useful to see your keys at night. Cool concept. Instead of lighting up the keys, the Shine version lights up below the keyboard. I’ve seen videos online that shows just how cool this feature is like a pulsating rainbow wave. I’ll save the LED testing for the full review…the options are amazing though I’ll probably end up with a simple underglow in blue. One quick take away is the underglow seems to improve the contrast of the keyboard much like backlighting on TVs make the colors pop and the colors stand out more. 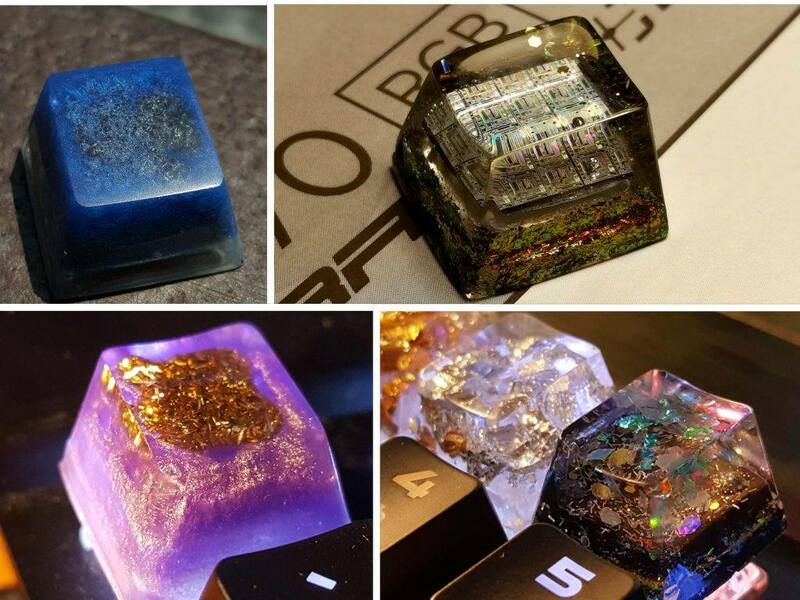 Never thought about an underglow for a keyboard before. I have been using back lighting on TVs for years now and prefer it enough that I’ve added LED strips to two TVs I’ve had over the years. This is the first layered keyboard I have used. Layers allow you to press some keys and cycle through different keyboard layouts so you can have one layer for typing, one layer for numbers, one layer for mouse movements, etc. This ErgoDox EZ supports up to 32 layers and comes built-in with 3 layers. I’m sticking with the default layout for now and it seems to work just fine on my PC and my Mac. The image to the right shows the default layout with three layers and is something you’ll need to print as a reference. The easiest way to change layers is to use their online keyboard layout manager then click on the Clone and Modify link. It’s crazy easy to use. The default layout is loaded up then you just click on the layer you want to edit then on the key you want to configure. You can set keys to do things like sleep your computer, one key copy, browser refresh, etc. You can really customize your keyboard exactly how you want it. You can even create layers for the applications you use like a Photoshop layer with the shortcuts you use, or Google around to download someone else’s layout. Once you have a compiled layout downloaded, you’ll need the flash tool which you can also download on the layout manager page. Here’s a short video on how to flash a custom layout. I’m going easy on the layers so sticking with just two layers right now. Frankly that is all I know how to switch anyway right now! I press the bottom right button and an LED lights up on the upper right of the keyboard leting me know I am in layer two which has controls for the backlighting, special characters on the lefts side, and a number pad on the right side. The built-in 3rd layer, the mouse layer, I haven’t tried yet. That’s it for now. It’ll be slow and steady to learn how to increase my productivity on this keyboard while doing so with much better ergonomic posture. I’m grateful to ErgoDox EZ’s CEO Erez who provided this keyboard for our review, and for creating a company that allows anyone to get one of these, not just folks that can wire up a custom board. Look for the part 2 review next month…or the month after that. Got a few trips planned so won’t have as much time to type as usual.